This recipe has been brought to you by S&B Herba Foods Ltd.
Soak wooden skewers for 15 minutes in water before use to prevent burning whilst cooking. Mix half of each of the soy sauce, sake and honey along with all the ginger, garlic and black pepper (to taste). Add 2-3 tablespoons of warm water, stir to combine the flavours. Add the chicken and mix well to coat the pieces thoroughly. Chill for at least 1 hour (preferably overnight if possible) turning occasionally to ensure even coating. Cook the rice in 2 parts water to 1 part rice for 20 minutes or until fluffy. Whilst the rice is cooking, thread the chicken onto the pre-soaked skewers and grill for the last 10-15 minutes (of cooking time). 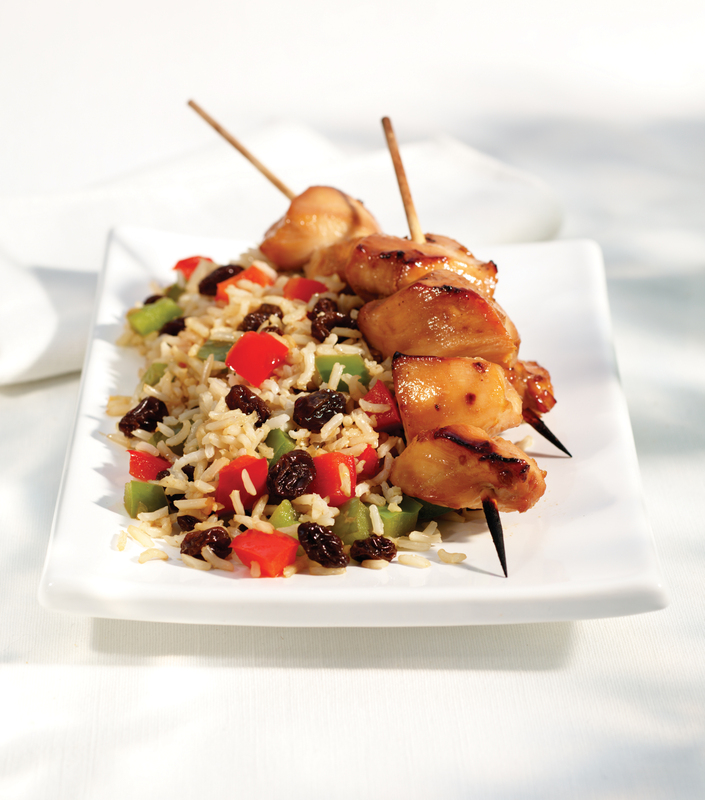 Turn and baste the skewers regularly with any remaining marinade. Stir-fry the peppers and shallots in a little olive oil or spray cooking oil until the shallots are just beginning to brown. Remove from heat. Place the remaining soy sauce, sake, honey and raisins in a saucepan with 2 tbsp warm water and gently simmer for 7-8 minutes or until the raisins are plump and most of the liquid. has been absorbed. Remove from the heat and serve with the kebabs.